When loved ones die, you surely wouldn’t forget reminiscing and writing stories about them. These stories are often read aloud during funerals and are often printed in booklets where everyone who has been a part of the person’s life. However, making these booklets are not a piece of cake. Aside from the fact that you would still need to remember memories of a person who is no longer with you, making something you have never done before adds stress to your already distressed current situation. This is why you are encouraged to make use of a ready-made booklet that will assure you that designing will no longer be much of your concern. In this article, we have prepared funeral booklet templates and examples that are pre-designed and editable for your own use. With these wonderful booklets we have prepared for you, you will surely give justice to the equally wonderful memories of your departed loved ones. Here is a high-quality funeral booklet that you should consider downloading if you are about to make one for the first time. Funeral booklets are not entirely necessary; however, the use of one can really help not only you but also the people who will be attending the funeral or memorial service of your loved one so they can easily follow through and fully participate. And right after the service, these funeral booklets can also serve as something they can use as a memento. The church or funeral home will surely offer to create a funeral program or booklet for you. But if you want to make sure that the funeral booklet that is personalized and that is reflective of the unique life of your departed family member or friend, it best if you handle the creation of the booklet of your own by making use of this funeral booklet template. This template is already well-designed that all you have to do is to add your own content. 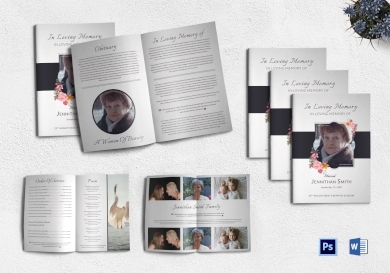 It is in making your own funeral booklet that you will feel rewarding because you get to create and distribute funeral booklets that truly reflect your departed loved one’s life. 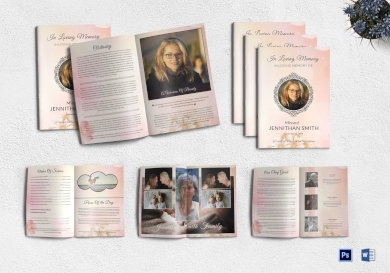 Are you having a hard time making a funeral booklet? Here is an example of a funeral booklet that you yourself can make. Even with a simple layout, you can still take a chance at effectively looking back on the life of the deceased. 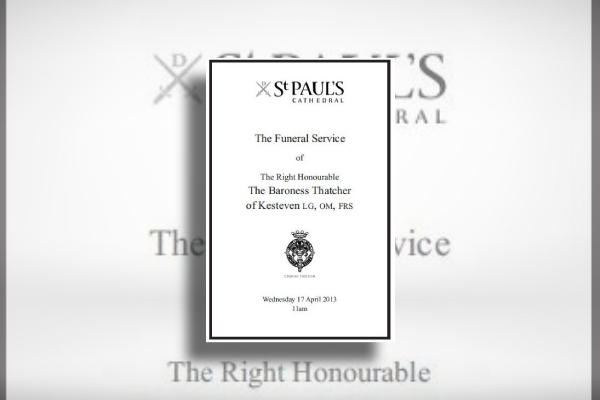 Making funeral booklets do not have to be complicated. The basic elements you can include on your design include the photo of the deceased, the name of the deceased, the deceased’s date of birth and death, a favorite passage, phrase, or quote of the deceased, and to add more character, include a fitting funeral program title. Photos are one of the best ways you can show and relive a moment from your departed loved one’s life. And with that, make use of such photos to make the funeral booklet you are about to create look more meaningful and relevant. 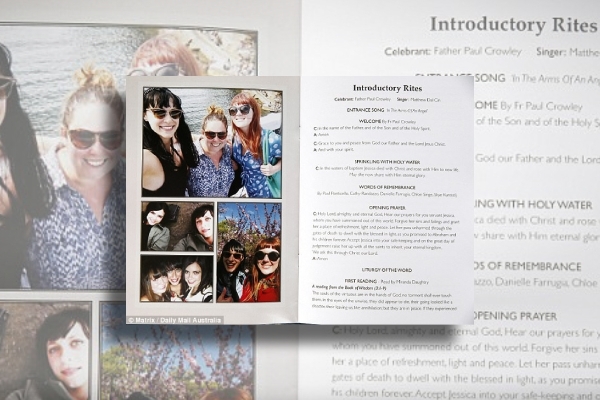 Take inspiration from this funeral booklet that includes a lot of photos that perfectly represents how colorful the life of the person has been. Upon receiving it, the attendees of the funeral service will surely feel relieved that he or she had lived a good life. 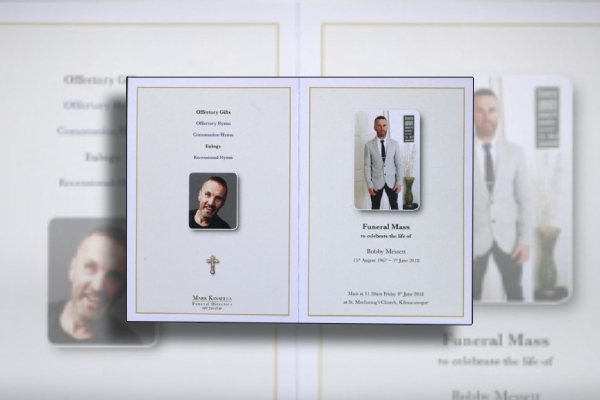 Creating a funeral booklet in time can be quite difficult even if the creative design is something you would dabble on a daily basis. This is because the death of your loved one could bring a mix of emotions that disrupt your creative process. And with that, it is best if you use a pre-made template or, better yet, create from scratch but start off with a really simple layout. All you have to ensure is that it contains design elements that are of high-quality and that the written content is truly reflective of your departed loved one’s life. We hope that the examples and templates of funeral booklets in this article have been of great help for you. Keep in mind that these templates can be downloaded for your own use, and to top that, you can also easily customize it using friendly-editing software such as Microsoft Word and Adobe Photoshop. As soon as you are done applying all your personal touches, you can also immediately print it.